Last month I had the opportunity to the Allume blogging conference in South Carolina. It really felt more like a Christian women’s conference with blogging and writing sessions and I loved every minute of it. One of the really great things about the conference was that I came home with a LOT of new books. Some were on writing and some were on faith and some were what I call practical books. I’ll be sharing many of these with you over the next few months. I first learned about Alana Chernila when I read a recipe for homemade mini pies in a magazine (Better Homes and Gardens, I think) when her first book Homemade Pantry was just being released. I knew I needed to see if our library had that book. They did and I checked it out so much that I finally had to just buy my own copy. The library is very generous with their check out policy but after about 3 months they insisted I not try to renew if for a while. You can read my review of that book here. So, when I found out that Alana had published another book, The Homemade Kitchen, I got a copy as fast as I could. This time the book didn’t come from the library but from Blogging For Books. This book is a cross between a cookbook and essays on food and how it’s more than just physical nourishment. I really like it. The book starts at the beginning with things like how to roast a chicken, how to cook rice, how to make a pie crust and quite a bit more basics. It then progresses through eight other themes…Feed yourself. Do your best, and then let go. Be helpful. Do the work. Slow down. Eat Outside. Invite people over. Don’t be afraid of food. 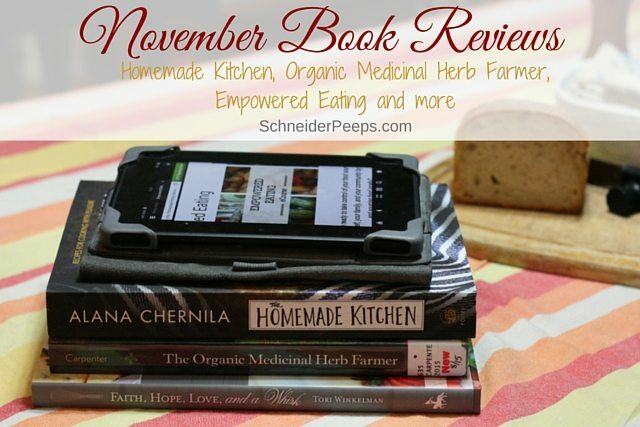 Each theme is a chapter and has an essay and many recipes. The recipes look amazing and honestly, most are very simple with the hardest part of most of the recipes being time. It takes time to cook from scratch. We’ve lost so much in our fast food culture. Alana calls us back to a time when food was not just about filling a belly, without making us feel guilty. I found The Organic Medicinal Herb Farmer in the new books section of our library. I don’t ever plan on selling the fruits, vegetables and herbs that I grow but I’d love to learn to grow more to better provide for our family. I would love to be able to grow our medicines, too. The first half of this book is the how-to portion. There is information on planning, growing, harvesting and marketing. I was surprised at how much of this section applied to me, even though I’m just growing for our family. The second section has 50 herb profiles. Each profile lists life cycle, plant description, growing conditions, propagation, planting considerations, medicinal uses, harvest specifications, post-harvest and drying considerations, pests and diseases, yields and pricing. These profiles make the book an excellent resource even for those of us who are not farmers. Faith., Hope, Love and a Whisk – Breakfast with the Savior is one of the books I received at the Allume conference. This is an interesting book because it combines recipes with devotional readings. 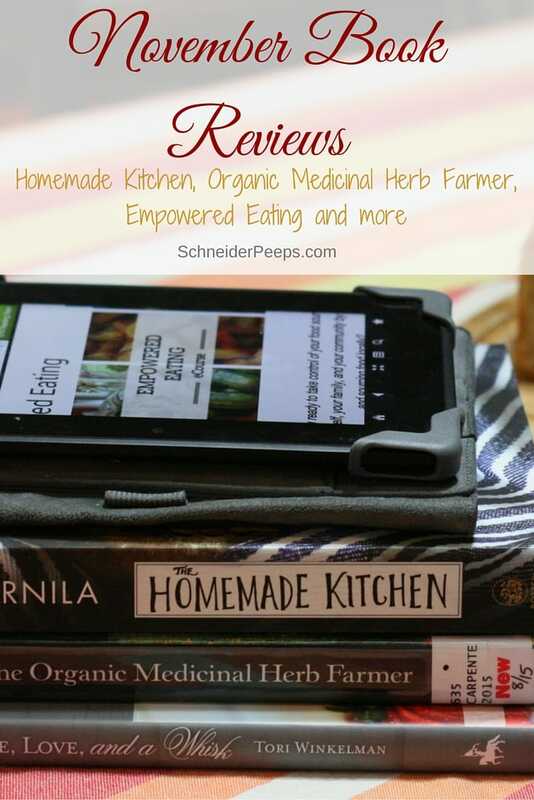 I haven’t tried any of the recipes yet but they look great and have real food ingredients. Some of the recipes are, lemon blueberry bread pudding, Mexican strata cups, spiced sour cream coffee cake, onion tart and pineapple breakfast punch. The devotional readings are well done and are thought provoking – which I love. Some of the topics are The Virtuous Woman, The Voice of Reason, This is my Offering, The Laws of Love and Stepping Out of Our Comfort Zone. While this probably isn’t a book I would buy for myself, it is a book I would love to receive as a gift and so it will be going on my gift giving list for bridal showers. Can we talk food for just a bit more? I had a playground conversation today with a mom who has three young children and she told me she spends $200 a week on groceries. (Now, I’m not the grocery budget police and I really don’t care how much people spend on of groceries, that isn’t the point of me telling this story.) She then told me that she buys packets with apple sticks and peanut butter for her son to carry in his lunch each day (at $1.50 each). She said she tried to just slice apples and send those with some peanut butter but her son won’t eat brown apples. I have conversations like these regularly with people – and no, I don’t bring the subject up – and most people in our culture are so dependent on convenience food that they’ve lost the ability to see what they are giving up to pay for that convenience. This mom said she knows that convenience foods are killing her budget but she doesn’t really know what to do about it. Enter Empowered Eating ecourse. 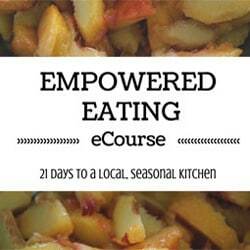 Empowered Eating is a 21 day ecourse to help you start or deepen your journey in local, seasonal eating. Each day the student gets an email with video, pdf or audio instruction, practical tips and recipes. The focus is on simple, yet delicious, local and seasonal foods. The student also has access to a private Facebook group for support and more inspiration. You also receive a mini gardening ebook, weekly challenges and information on foraging and preserving food. This is the kind of teaching that moms and grandmas used to pass on to their daughters and granddaughters.